Paytm has again introduced a good offer in which customers get Cashback up to Rs.100 for three transactions.We will show you how to avail. 2) Login or Signup to your Paytm account. 3) Go to Mobile Recharge Section. 4) Initiate a Mobile Recharge or Bill Payment. 5) Enter Operator and Details. 6) Enter Amount for Recharge. 8) Pay amount through desired payment method. 9) Done, You will get cash back in your paytm wallet within 48 hours. 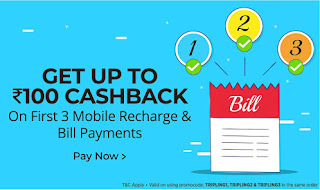 1) Earn Cashback upto Rs.100 on three transactions on mobile recharge or bill payment on Paytm. 2) Use Promocodes TRIPLING1, TRIPLING2, and TRIPLING3 in 3 recharge or bill payment transactions to be eligible for this offer. 3) Promocodes need to be applied in the same order. 4) 3% upto Rs.20 cashback will be given on first transaction. 5) 3% upto Rs.30 cashback will be given on second transaction. 6) 3% upto Rs.50 cashback will be given on third transaction. 7) Promocode is valid only on Recharges and Bill Payments. 8) Offer is valid for limited period only. 9) Cashback will be credited within 24 hours of the transaction into the user’s Paytm Account. 10) Complete KYC To avoid Pending Cashback.